100% of all donations go directly to Queensbridge Primary Parent & Teachers Association. You can still donate some or all of your proceeds to our cause! Whilst the jumbletrail is predominantly a community event, we are also trying to raise money for a school community and children that really need it. Kids are our future and they deserve as much as we can give them. The school works miracles with the money it gets, but if we can get big amounts through fundraising, we can make big differences to the school and to the enrichment of the kids! Our dedicated parents have put in a lot of time and effort to make this event happen, please give as much as you can - every penny will be very gratefully received and used. Every single pupil at Queensbridge Primary School stands to loose around £400 in funding during the next academic year due to government cuts. Our children are the future and deserve the very best education. The Queensbridge staff are inspirationally brilliant and create magic with the resources at their disposal. They need our help to go some way in plugging the shortfall in their budget. With your help we’re aiming to raise money to fund supplies and equipment. Anything we can raise will benefit the whole school. All funds will be administered by the Queensbridge PTA. Please help us do more. The more we raise the more we can do! We are most grateful for all support and hope that interest and generosity will continue in the future. The money raised makes a significant difference to the provision the children receive. Thank you so SO much for a fantastic day!!! 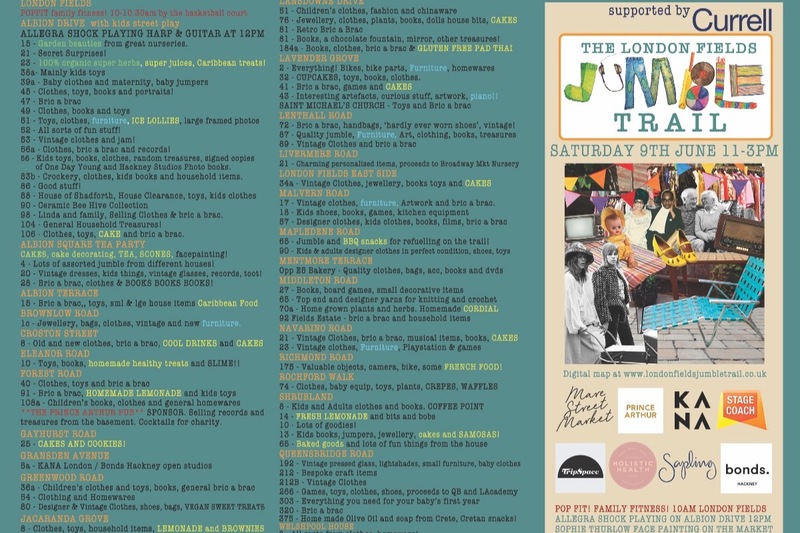 Whilst the jumbletrail is predominantly a community event, it’s also a great excuse to raise money for a school community and children that really needs it. We are trying to raise as much as possible so please donate any proceeds from the day to us either via our gofundme site ( www.gofundme.com/the-london-fields-jumble-trail) or if you’d prefer to give us cash you can drop it off at 28 Albion Square, 51 Albion Square or at Queensbridge School after the event. Please keep giving - every penny will be very gratefully received and used. We will be back in touch soon with a full update about the event. 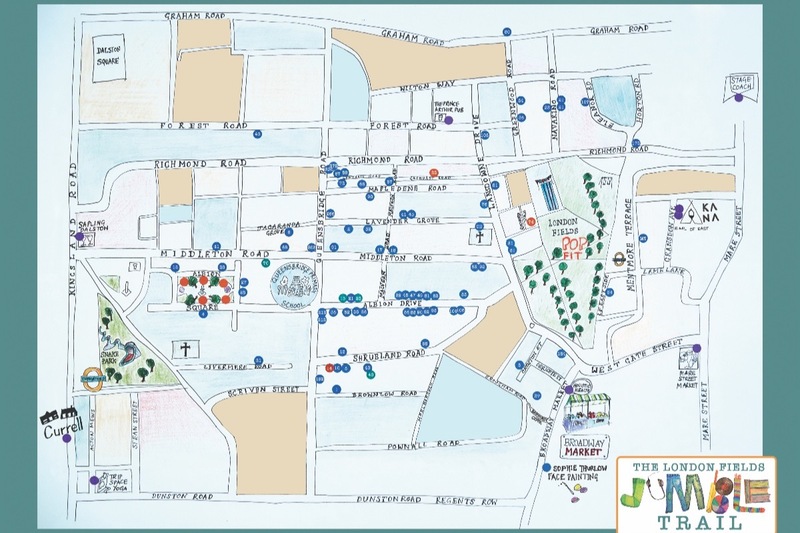 There's only four days to go and we will shortly be delivering copies of the printed maps to all of you to have on your stalls on Saturday. We have nearly 100 stalls now and we want to do everything we can to do a final push for sign ups and also to make sure we have lots of buyers on the day. We would never have got so far without your incredible collective support. As you know, we've been spreading the word in person, online and through press for a few weeks but we are looking for help to distribute the new map leaflets locally this week before kick off on Saturday – and please also continue to spread the word by following and sharing us on social media. Anyone who wants to help will be welcomed with love and open arms but no pressure or obligation - at all! People can either grab map leaflets by knocking on 28 Albion Sq after lunchtime tomo or we can organise groups of people to combine and work together. Please shout direct at jumbletrailsponsors@gmail.com if you are able to help in any way. We would also love to hand out maps at pick up or drop off at London Fields School, St Michaels, Hackney New School and any local nurseries on Weds/Thurs/Fri this week – if anyone has any links with them and is able to reach out that would be brilliant. Putting up posters (again) in local businesses in Broadway Market, Kingsland Road, Richmond Road and Columbia Road. Individuals don’t have to take this all on – even if you can only take on a little bit, just shout and we’ll help coordinate. A3 posters are available to collect at 28 Albion Square from Thursday lunchtime. The more helpers, the wider our reach and the less work we’ll have to do individually! Thanks so much for donating!!! 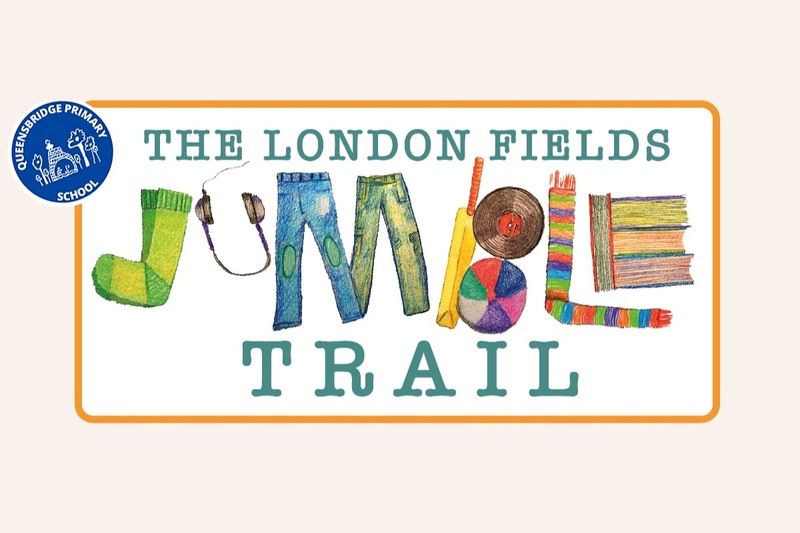 If you are hosting a stall, please make sure you have also sent your stall details and address to londonfieldsjumbletrail@gmail.com to ensure you get on the map! And please ensure you encourage as many others to join whether through school or neighbours. This Friday is the deadline to get on the printed map. (Although the digital map will keep on evolving.) And finally, please please follow and share us socially - it will help us be big! !